These units, or NUCs for short, are meant to be lightweight computers for the living room or desktop, and they include mounting brackets for hiding behind a television. A motherboard, CPU, heat sink, fan and power brick are included, but users must supply their own storage, RAM, wireless adapter, and operating system. The new Intel NUC is roughly a half-inch taller than its predecessors, but that extra headroom allows you to stuff a proper HDD inside the enclosure. The maximum hard drive thickness is 9.5 mm, which translates to 1 TB of storage at most. Intel's previous kit had a SATA port but no room for an internal hard drive, so users were limited to solid state storage through the NUC's mSATA connection. That wasn't ideal for users who wanted to load their NUCs with a full library of music, movies, photos, or games. Even for solid state-only setups, a standard 2.5-inch drive will be a little cheaper than an mSATA SSD, as Ars Technica points out. Aside from the added storage, the new units are nearly identical to their shorter counterparts. Model D34010WYKH includes an Intel Core i3 4010U processor soldered to the motherboard, while model D54250WYKH has an Intel Core i5 4250U processor. Both have two slots for DDR3L RAM (up to 8 GB), four USB 3.0 slots, mini-HDMI output, half- and full-height mini PCIe ports and Gigabit Ethernet input. According to LegitReviews, the taller models will be roughly $10 more expensive, bringing the price to around $295 for the Core i3 model and $373 for the Core i5 model. After you outfit the NUC with an operating system, storage and RAM, you'll be in the neighborhood of $600 to $700. You're paying a premium for the compact design, but you can do better on tech specs if you don't mind an uglier, slightly larger rig. Meanwhile, the inability to upgrade the NUC's processor over time is still a concern. 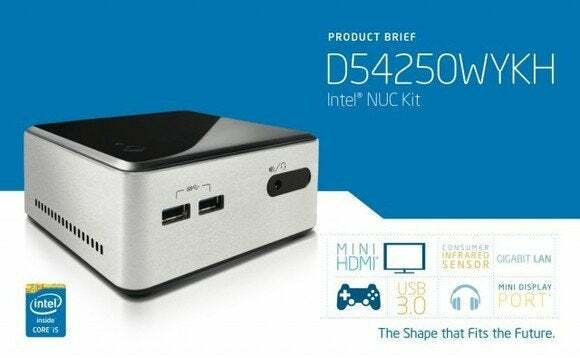 The new Intel NUC kits aren't available just yet, but they should pop up on Amazon, Newegg, and other retailers in the coming weeks.